Try this easy way to enjoy international flavour any night of the week. Mix dressing and seasonings. Pour over chicken in shallow glass or plastic dish; cover. Refrigerate 2 to 3 hours to marinate. Drain; discard marinade. Preheat broiler. Place chicken on rack of broiler pan. Broil, 4 to 6 inches from heat, 3 to 4 min. on each side or until cooked through. 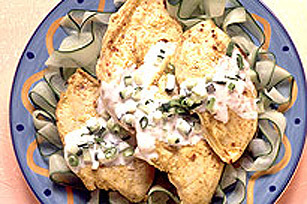 Place chicken on serving plate; sprinkle with the cucumber and onions. Serve with hot cooked rice and a fresh fruit salad.